Rankin Lewis began writing health- and fitness-related articles in 2010 after 15 years working as a certified athletic trainer. His work appears in various online publications. Lewis has a Bachelor of Arts in business administration from Friends University and received most of his athletic training education at Temple University. Sports and games have been part of human society for thousands of years. The importance of these things should not be underestimated. Much of young children's learning comes from participating in sports and games, and this same participation as adults can lead to happier, healthier and more productive lives. Games and sports have been around for thousands of years. The Egyptians' senet is the earliest example of a board game and dates back to 3000 B.C. The first traces of competitive sports also go back to the Egyptians around 2000 B.C. In an Egyptian tomb at Beni Hasan, archeologists found numerous wrestling pictures depicting many holds and moves that are still used today, according to HistoryWorld.net. 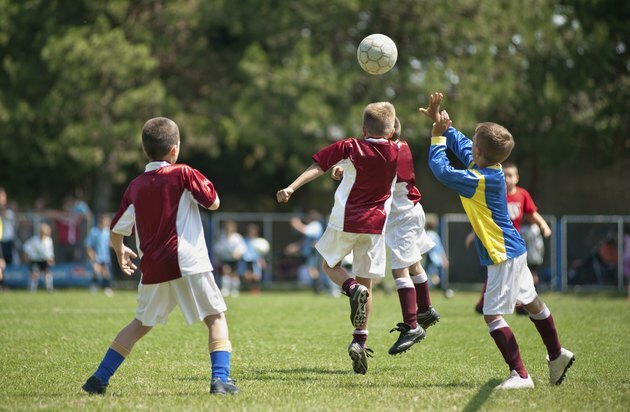 The benefits of sports in the development of children is well documented. An Ad Hoc Committee on Sports and Children said the potential benefits from sports to children and adolescents includes the development of healthy physical and social skills, the development of fine motor skills, and both improved health and sport-specific fitness. This is particularly true for adolescents who are physically or emotionally challenged. Playing cards and board games also benefit teens, providing a quiet and yet competitive outlet where they can interact with their peers or older family members in a positive manner. Adults need 150 minutes of moderate-intensity aerobic activity each week, coupled with muscle-strengthening exercise at least twice a week, according to the Centers for Disease Control and Prevention. One of the ways to accomplish at least part of these goals is to play sports such as tennis, basketball or racquetball. All of these would qualify as aerobic activity while they also allow you to compete and have fun. Participating in indoor games such as chess, checkers and board games with family and friends also provides a social interaction that helps relieve the stresses of daily life. Senior citizens stand to benefit the most from being involved in sports and exercise. Increased cardiovascular endurance, better balance and flexibility, and a reduction in the effects of illnesses are a few of the benefits. Some not-so-obvious benefits are better sleep at night, a boost in self-confidence and a better mood, as well as preventing memory loss and a decline in cognitive abilities. In addition, a study conducted by psychology professor Arthur Kramer of the University of Illinois found that playing a strategic video game improved older adults' memory, reasoning ability and cognitive functions. A study reported in the "New England Journal of Medicine" concluded that leisure activities, including board games, were associated with a decreased risk of dementia in senior citizens. Games have also long been used to educate children, teaching things such as taking turns, following rules and enhancing verbal communication. Playing games together also strengthens family and community ties, providing a nonconfrontational opportunity to communicate and build relationships between children, teens, parents and the elderly.